The drama, painted in stark relief, shows the limits to national sovereignty that countries face as they attempt to strike a balance between humanitarian values (often specified in international treaties) and the mandate to manage the flow of migrants. Even as numerous countries welcomed large numbers of migrants, the challenge of long-term integration by these newcomers into local communities loomed large. 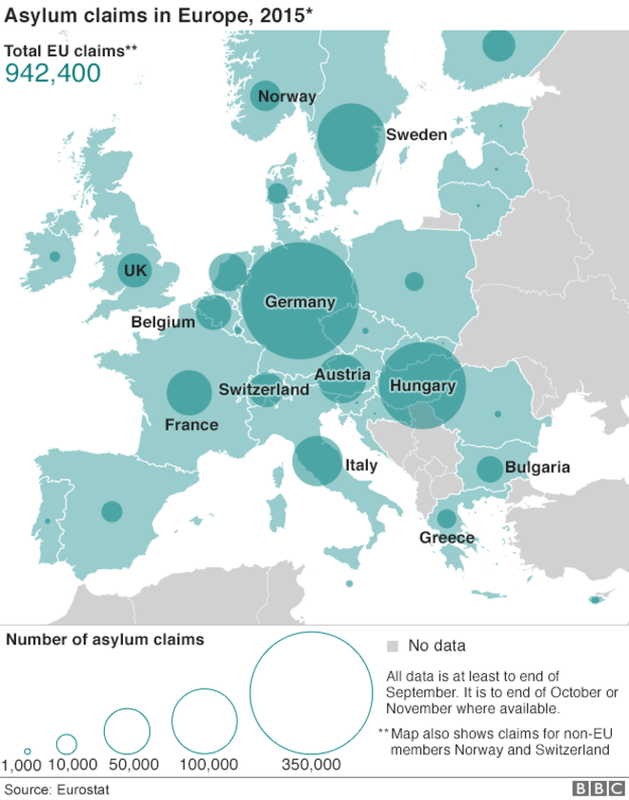 The 2014 Migrant Integration Policy (MIP) Index shows that those who find refuge in top five integration policy nations such as Sweden, Portugal, Finland and Norway will be met with more supportive policy structures than those settling in Greece (tied for 27th) or Romania and Hungary (tied for 23rd). Here in the U.S., despite a much smaller number of refugee admissions, the search for best practices in integrating newcomers is also an important issue facing public administrators. According to the MIP Index, U.S. policies are the ninth best among developed nations. To look at this issue, we first examine where refugees are being resettled and then discuss briefly the political and logistical considerations that public administrators may face in providing services to newly arrived refugees. The image below is a visualization of Office of Refugee Resettlement (ORR) data from Fiscal Year 2013 about where the ORR resettled refugees. Each circle represents the total number of individuals. Shading indicates the average wage rate earned by refugees. The question of refugees became a political lightning rod after terrorist attacks in Paris and San Bernardino, Calif., (where neither attacker was a refugee) and the arrests of several permanent residents admitted as refugees for attempting to support the Islamic State. After the Paris terrorist attacks, Members of Congress, state governors and a few local officials sought ways to stop the resettlement of Syrians within their borders (check out this NY Times map of where Syrians have been resettled since 2012). However, those seeking to bar resettlement found there were few avenues for interfering with a program that links the federal ORR with local nonprofit programs such as Catholic Charities and Church World Service. These organizations, supported by grants from ORR, assist refugees in integrating into their new community and becoming self-sufficient. As a recent protest and counter protest in the small city of Lancaster, Penn., shows, public administrators are making decisions within a context of sharply divided public opinion. This political tension in local communities and among different levels of government points to the relevance of a 2012 finding by the General Accountability Office that greater consultation by local agencies with community stakeholders could be an important part of strengthening refugee integration programs. There are resources on these topics developed to support local communities in their efforts to integrate refugees into their new communities. The following is a short list gathered as a potential starting point for practitioners developing integration efforts. 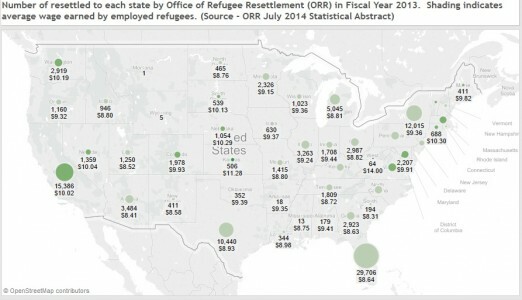 ORR has a resource page linking to resettlement, integration, health and economic development resources, including a Center for Applied Linguistics set of resources on refugee integration practices and a Catholic Legal Immigration Network (CLINIC) flyer summarizing eligibility for resettlement assistance for asylees (a subcategory of refugees). Resources for educators from the US Dept. of Education on responding to the needs of English Learners in local schools. Welcoming America, a nonprofit organization, developed a community planning process guide for convening stakeholders and developing welcoming responses to refugees. They also have sponsored a series of webinars that are available to interested persons, including a recent December 2015 webinar on Local Government and Resettlement: Tips for Working Together for Refugee Welcome. Author: Grant Rissler is a Ph.D. student in public policy and administration at the L. Douglas Wilder School of Government and Public Affairs, Virginia Commonwealth University (VCU). A former immigration paralegal, his current research focus is local government responsiveness to immigrants. He also serves as assistant director for programs for the Commonwealth Educational Policy Institute at VCU. Grant can be reached at [email protected].